During summer, when tomatoes are excellent in the South of France, you will find a “fast food” worth searching out. Fresh baguettes are spread with tapenade, chopped tomatoes and stuffed with tuna and a few bitter greens. This recipe shines with the correct products. You could make a tapenade with jarred kalamata olives and martini olives but the difference is astounding when using oil cured or dry cured black olives and crisp, firm green olives. Look for them in gourmet food shops where you can sample and buy from open containers. I like to keep the tapenade a little coarse, rather then making a smooth paste, so you taste the unique flavor of each olive. Choose a high quality canned tuna that separates in large flakes. Usually Spanish or Italian brands work well and there are many small catch U.S. brands from Alaska or Washington state that are excellent for around $5 a can. Buy tuna packed in olive oil. As the tuna cooks in the can the oil collects the juices. This is added to the tapenade. Select a tomato that smells ripe and it will have good flavor. Core the tomato, cut in half across the center and squeeze out the seeds and juice. Chop coarsely and sprinkle sugar, salt and pepper. Set aside. In a food processor chop the olives with the lemon juice and mustard using a few quick pulses. Drain the oil from the tuna into the processor and add the olive oil. Pulse briefly just to combine. Heat an oven to 350. Slice the baguette lengthwise into halves, spray with oil and toast until the cut side is firm. Rub cut sides with the garlic cloves. Spread one side of the baguette with a large amount of tapenade and smash half the tomatoes into the other side. 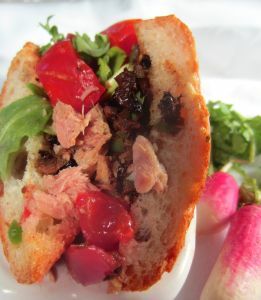 Layer the tuna and greens between, add a few grinds of black pepper and close the sandwich.